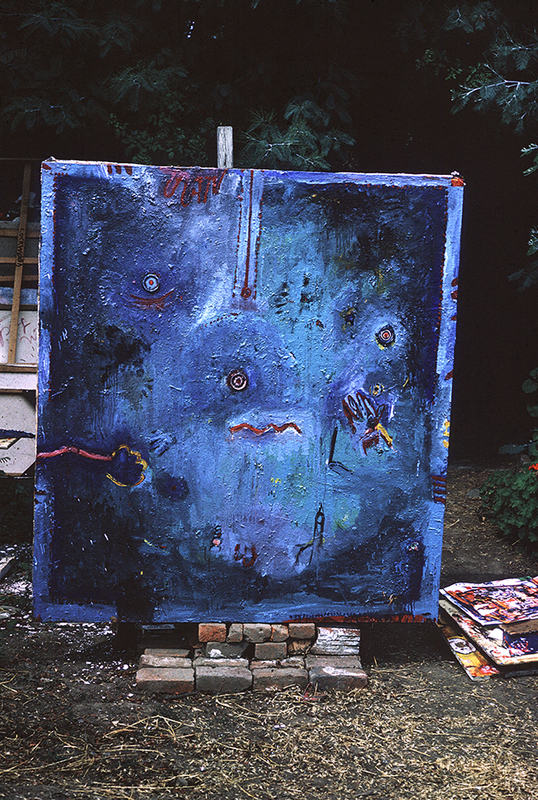 In 1962, Elizabeth Murray left Chicago for graduate school at Mills College. “It wasn’t like being in school,” she said of her time at Mills, “Nobody bothered me and it was two years to work. Rather than being scared that I couldn’t do it, I felt I could, that I was an artist. ” But what kind of work did she make? With the discovery of a small group of slides in the artist’s upstate studio… now we know. “View of S. F. (San Francisco” was painted in the fall of 1963 and features a composition of a painting within a painting—a device she likely borrowed from Jasper Johns, whose retrospective she saw in 1962 when it traveled from the Everett Ellin Gallery, Los Angeles to the Richmond Art Center, Richmond, CA. Horsfield, Kate and Lyn Blumenthal. Profile. Vol. 5, Elizabeth Murray. Chicago: Video Data Bank of the School of the Art Institute of Chicago, Summer 1986. Published transcript, p. 6. McCarron, John. “interview with Elizabeth Murray.” Shift 5 (San Francisco) Vol 3, No 1 (1989), p. 16, Published quarterly by San Francisco Artspace. Interview with Elizabeth Murray: Early Work by Fine Contemporary Artists: Ron Gorchov, Elizabeth Murray, Dennis Oppenheim, Dorothea Rockburne, Joel Shapiro at the The New Museum, exhibition catalogue, n.p. Horsfield, Kate and Lyn Blumenthal. Profile. Vol. 5, Elizabeth Murray. Chicago: Video Data Bank of the School of the Art Institute of Chicago, Summer 1986. Published transcript, p. 7.